Natural Power, working together with the international law firm Eversheds, has successfully secured consent for the Brenig Wind Farm tip height extension on appeal. 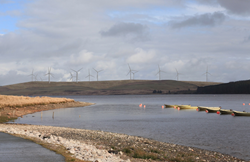 The consented scheme (48MW) takes the maximum blade tip height of Brenig from 100m to 110m, whilst keeping the location of the 16 turbines and infrastructure the same as the scheme consented in 2009 (40MW). Since opening the Welsh office in June 2005, Natural Power has now successfully consented 426MW of onshore wind in Wales, equivalent to 36% of all onshore wind farms that have been consented in Wales in that time. Working for its client, Brenig Wind Ltd, Natural Power provided the technical input required to demonstrate the clear benefits associated with extending the wind turbine tip height of the consented scheme from 100m to 110m, including the increased energy yield from the site over the lifetime of the project, whilst demonstrating that the increase would not cause unacceptable significant impacts above the 100m consented scheme. Through the construction activities undertaken on site so far, over £1m in contracts have been awarded to Welsh companies, thus vastly benefiting the Welsh economy. The project, which was initially refused by the planning committee at Denbighshire County Council on the basis of the impact to landscape, is located in North Wales, 13.5km east of Snowdonia and 15km west of the Clwydian Range Area of Outstanding Natural Beauty (AONB). Established in the mid 1990s, Natural Power is a leading independent renewable energy consultancy and products provider. The company offers proactive and integrated consultancy, management and due diligence services, backed by an innovative product range, across the onshore wind, offshore wind, wave, tidal, renewable heat, solar pv and hydro sectors, whilst maintaining a strong outlook on other new and emerging renewable energy sectors.